This event happened when he was six years old, and he lived to tell the tale, obviously. The story startled me, though, as he was so blasé about the whole thing that he only got around to telling me about it last month, after eight years of marriage. He had been hanging about by the entrace to his home, a skinny little boy in shorts and baggy socks. It was the afternoon, still hot and sunny and well before the 6pm curfew that the residents of his dangerous neighbourhood, Brancaccio, imposed on themselves voluntarily for their own safety. One of the neighbours, an old man who had just retired, was popping out to the baker’s for the fresh loaf of bread which everyone in Palermo seems to consider indispensable with their evening meal. He suggested little Hubby accompanied him, so he could buy the evening loaf of bread for his Mother. After getting permission from Mamma, otherwise known as The Godmother, he skipped off, trying to keep in step with the long strides of old Signor Gambino. They were coming out of the bakery when suddenly little Hubby heard a rapid series of explosions. They were going off all around him, so loud and close that they sounded as if they were exploding inside his own head. He was petrified and froze, rooted to the spot. A scene from the film “Brancaccio”, which tells the life story of Padre Puglisi. Click on the photo to go to my post on his life. The old man grabbed him, tucked under his arm, and started running back towards their apartment block as fast as he could. Despite being 66 years old and carrying a six-year-old and two loaves of bread, my husband is absolutely sure he went faster than Usain Bolt. Little Hubby started crying and asked what the noise was. While running, the old man told him that some naughty big boys had been setting off fireworks in the street, but there was nothing to be scared of. It was a small miracle that no stray bullets hit my husband or his elderly protector. “At least I got him back without dropping the bread,” the old fellow joked, as he safely delivered little Hubby back to The Godmother. My husband gradually came to realise what had really happened as he grew older and overheard adult conversations going on around him. He asked the elderly man about the event some years later, and learned that several people had been killed that afternoon. He was not allowed to go and buy the bread again until he was an adult. 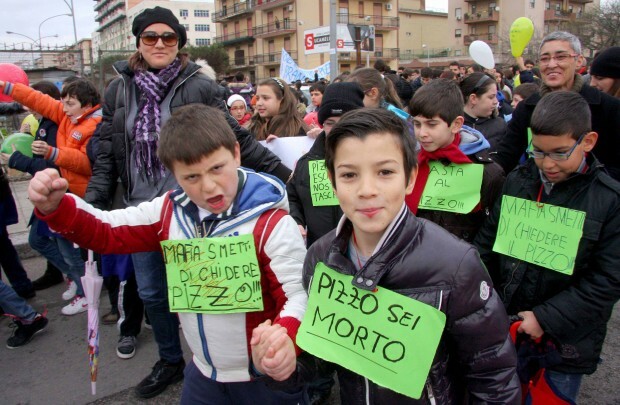 Kids in Brancaccio recently, in a protest march against paying “pizzo” (Mafia extortion money). The idea of doing something like this when my husband was their age would have been completely unthinkable. I am so glad his life was spared that day! Must have been a traumatic event for a 6 year old! What a lucky boy he was that day…. And what a super man to keep a lid on the reality behind the noise. I’d say it’s unthinkable that the mafia can still extort money from people in this day and age. I think that’s the part that struck me most about the whole story – how quick thinking and brave that old man was to protect him not only physically, but mentally. I think he saved him from a childhood of living in fear. Heart breaking. There are some really horrible stories of innocent people getting by crossfire and stray bullets. 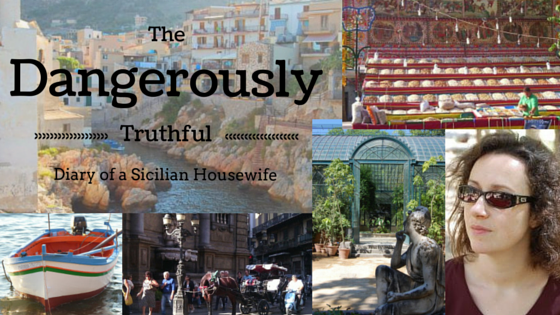 Sicily really has changed a lot for the better over my husband’s lifetime. I think Calabria and other parts of southern Italy (Camorra and Ndrangheta areas) are worse than Sicily these days. Glad to hear that Sicily is better off now, but I assume there is still some work to be done. Mary Taylor Simeti in her book talks of the Mafia, too, and says, it became better – but she is at least one generation ahead of you, so … did it really become better? Or did you only get used to it? I’ve only been here 8 years and I haven’t noticed any real change over this time period. But there has been a huge change since the seventies and eighties. They don’t have shoot outs in the streets any more. Murders still take place, but you hear about them afterwards, you don’t see them happening around you. I think changes are not gradual, they come in huge steps when someone brave takes a high profile stance. The last to do so were the judges Falcone and Borsellino. Things have been at stalemate since then. OMG, how dramatic! 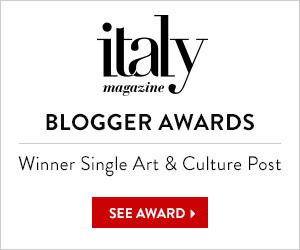 I am still surprised how blasé Sicilians are about the violence that goes on around them. It must be the old omerta’ survival gene that kicks in. There definitely seems to be a large element of that omerta nonsense still in their hearts. Though sometimes I wonder if there is also an element of being ashamed of it all in front of foreigners. Tough ‘hood. I have a cool b/w photo of a kid shooting a gun from Brancaccio. Not sure where I found it. I’m really glad my grandparents bounced 100 years ago. Sicily seems like a badass place to live, but a lot of wasted energy, time, and lives. Let me know how to e mail you the photo if you want it.